This year three of our staff joined the international ranks of Mo Bros and Mo Sistas to raise money and awareness for men’s health. 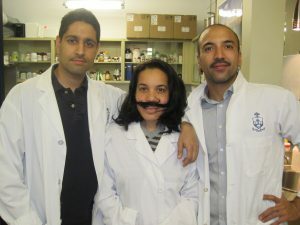 Our Spor-Mo-Metrics team consisting of A ”mean stache” Maharaj; Mike “the handle-bar” Saleh, and “Yor-de-cutest Mo Sista” Guardiola raised over $1000 for Prostate Canada. Congratulations to all the Movember participants and supporters across the globe who raised over $110 million of vital funds and awareness for men’s health, specifically prostate cancer. A special congratulations to our client Stantec, lead by Steve Fulford, who by raising over $122k climbed the team leader board to #3 in Canada.